Coach Paul Johnson said that Tech kicker Shawn Davis is “probably” out for the season, the Atlanta Journal Constitution reported Wednesday. Davis had served as Tech’s main kicker since the start of the season, filling the void left at the position since Harrison Butker departed Tech for the NFL. Despite a rough start to the season, missing a game-winning field goal against Tennessee in Tech’s opener, Davis had improved as the season went on, hitting 14 out of 15 extra point attempts and hitting both of two field goals attempted since Tech’s opener. Davis suffered what is believed to be a torn ACL during Tech’s game against Miami last Saturday, when he attempted to tackle a Miami returner. Davis was questionable for Saturday’s game against Wake Forest this week after the Miami game. For the rest of the season, Tech will need to rely on freshman kicker Brenton King, the only other Tech kicker to attempt field goals this season. King has made both field goals attempted this season, one against Miami and another against UNC. Davis and King had competed for the starting kicker job entering the season, but King was hampered by a groin injury, giving Davis an opportunity to take over the starting role as kicker. Behind King in the depth chart would likely be senior Bennett Barton, who saw action in 2014 and 2015 as a receiver, but recorded no statistics in any of his appearances. 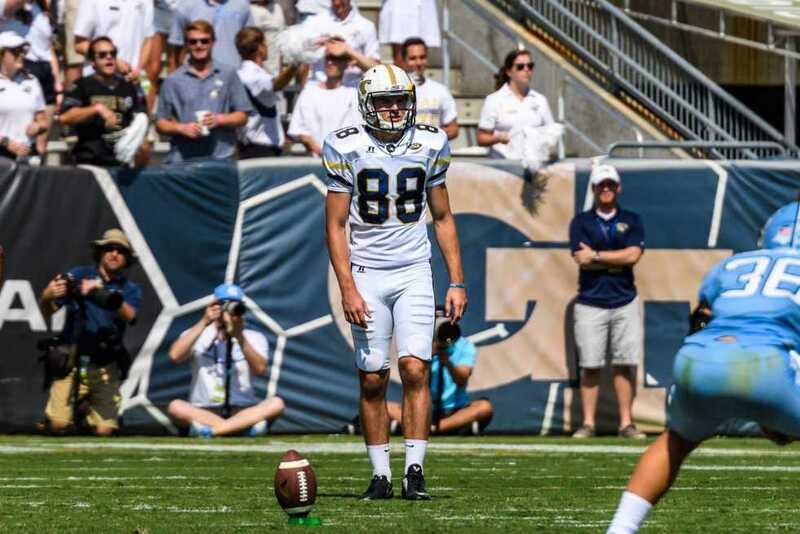 Barton changed his position to be a full-time placekicker last offseason, but he has only seen action in a handful of games this season, missing an extra point attempt against UNC earlier this season. Despite the rainy conditions later in the game that put a damper on Tech’s running game, Davis’s injury came before a heavy fourth quarter downpour, when the field was relatively dry. Tech saw several players go down against Miami in addition to Davis. Most notable was the loss of explosive BB Kirvonte Benson to a leg injury during the game. Johnson indicated that Benson is likely to be ready to play against Wake Forest on Saturday, giving a much needed offensive boost to the team, which struggled to score points without him.